Take a look at that view - and the new space atop No Studios. Published March 16, 2019 at 9:56 a.m.
Lisa Caesar remembers how the building at 1037 W. McKinley Ave. looked before No Studios moved in. The space is technically two connected buildings, and while one was mostly just in need of a refresh, the other – built in the late 1800s – was, according to the chief operating officer, "raw. I don't think it had been renovated since the horses came through." As of just last July, the floor was dirt and gravel, the ceiling was decorated with hanging debris, and it wasn't even safe to be inside of it. The days of dirt and debris, however, are well in the past, as barely more than a year after Oscar-winning screenwriter John Ridley introduced the idea to Milwaukee, No Studios has brought life and art to the once-defunct space. Where there was once "a literal mess," there's now a gorgeous communal workspace complete with local art on the walls, a coffee and drink bar, a private screening room that feels like a friend's awesome basement but better (with better bookings as well, including premieres of movies like "Vice" and "If Beale Street Could Talk" in addition to live musical and theatrical performances), a plug-and-play stage for live shows and plentiful seating for either work or events like author visits and guest speakers. Where there were once empty classrooms and offices, there's now a full list of tenants including Milwaukee Film, the Milwaukee Filmmaker Alliance, UWM, Marquette, Gener8tor, 371 Productions, The Duncan Group and more. And beginning this weekend, there's now a cozy rooftop bar space for this vibrant one-of-a-kind creative hub. The space will make its grand opening on Saturday, March 16, with a plethora of events scattered throughout the entire building from 10 a.m. until midnight – including two performances from the Milwaukee Youth Symphony Orchestra at noon and 6 p.m., local music videos playing inside the screening room, a makers market from 10 a.m. until 4 p.m. on the second floor, an open house for the tenants located inside No Studios, live performances from Q the Sun and Friends (8:30 p.m.) and DJ Tarik Moody (9:30 p.m.), snacks, drinks and more. If you're unable to drop by today and see the new space, however, we've got your back. (Though you should still try to make it there.) Here's a quick peek at the latest piece of No Studios' impressive home. At about 4,000 square feet, the new glass-encased rooftop area fits perfectly with No Studios' aesthetic: an open, yet cozy, space that offers unlimited potential for hosting events, showcasing art and just merely rising above the noise and the hustle of your work on the ground for a relaxing break. Comfy chairs and couches are scattered around the open area, perfect for conversation or, frankly, whatever a member needs or desires. "It's fun to be able to have a space that we can activate in many different ways," said Caesar. As you might expect and hope from a space in an art hub, there's art showcased throughout the rooftop level. 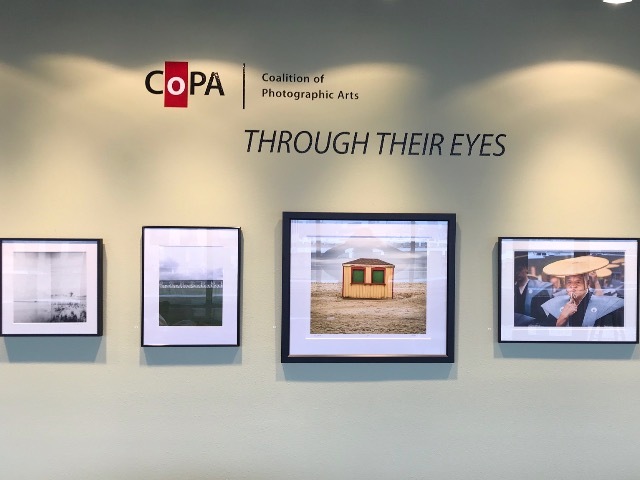 Currently the numerous pieces found on the walls – all for sale – are from the Coalition of Photographic Arts (CoPA), a trade organization of photographers in Milwaukee. The art will be regularly rotated in and out, showcasing different genres of art and different art organizations and groups throughout the year. "It helps us showcase in other parts of Milwaukee, because we're never going to be the Milwaukee Symphony or a photography gallery," Caesar noted, "but I think what we can do is give folks a little bite-sized exposure to these other artists, and we can launch them to a different destination to learn more or to get more immersed in that art." This being Milwaukee, of course there's also a bar on the rooftop level. 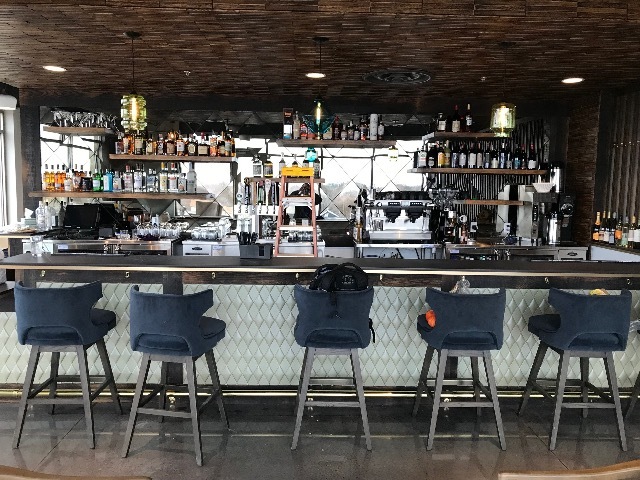 Located behind a stylish fence-like barrier, the bar offers drinks as well as an addition space for comfortable conversation and relaxation. Combined with the catering staging kitchen, the rooftop has all a tenant or member would need for hosting a gathering, gallery or whatever unique event they have in mind. 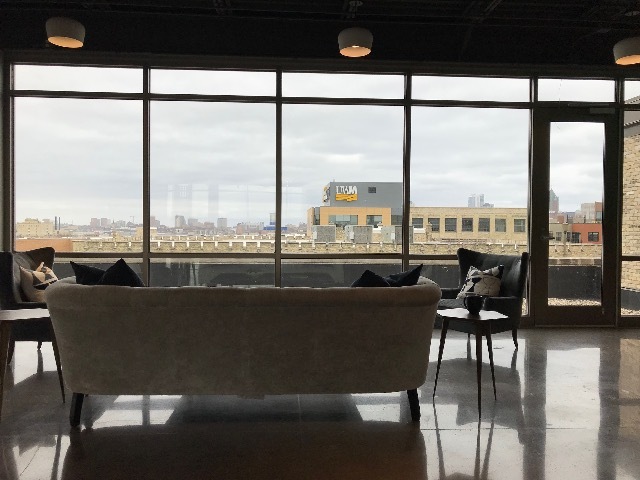 The beauty of a rooftop space is, of course, the beautiful view – and No Studios' new rooftop area definitely has one, looking out east over the former Pabst Brewery area and stretching all the way out to the ever-expanding Downtown skyline. 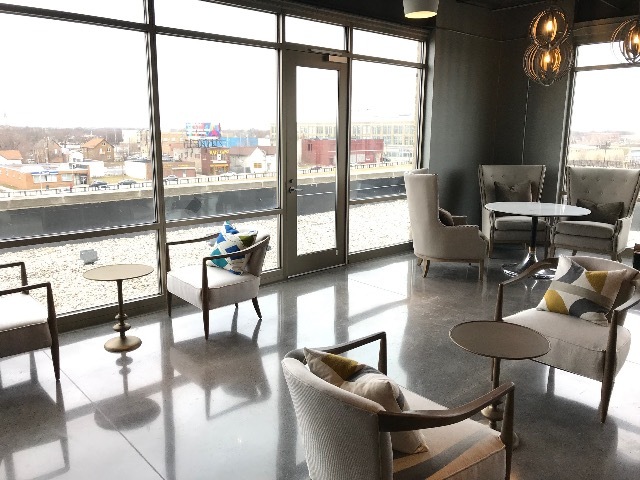 The building is only four floors up, but considering it sits on a slight hill, it provides the perfect backdrop for festivities and conversation – even more so when No Studios adds an outdoor patio to the rooftop level. Caesar noted that they intend to finish the outside deck, which will hopefully circle the entire space, by late summer or early fall. The new rooftop space is remarkable, but in its current form, it's also a blank slate. It's now up to the members of No Studios to truly fill it with whatever ideas they desire: art galleries, live performances, networking events, social gatherings and more. "You can almost think of No Studios as owned by the members; it's almost like a mutual society," Caesar explained. "I will help curate and we provide a lot of marketing support and we'll guide a little bit, but it really belongs to the community. The members will decide what art is hanging. As long as the space is available and members approach us with a great idea, it's going to happen. "If you don't like what you're seeing, simply program what you want." That's the most exciting part of the new rooftop space, and No Studios in general: not just what's happening now, but the unlimited potential for what could happen there in the future. To be a part of that, memberships of various levels are available at No Studios' website. 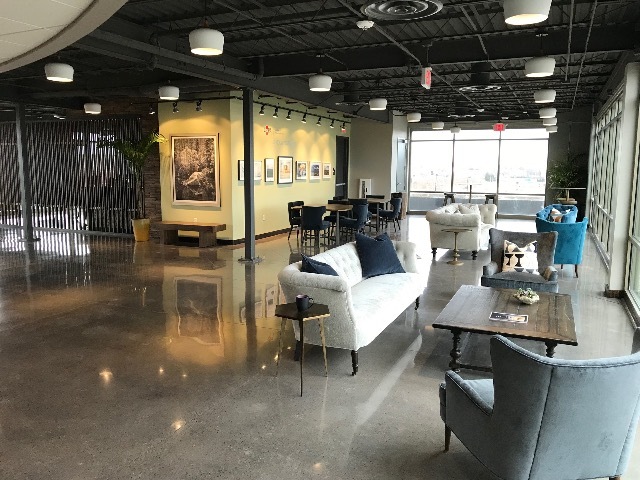 The club level, costing $200, includes access and use for both the ground floor spaces as well as the new rooftop, while the artist level membership offers the ground level utilities for hosting for $45 a month. And for those who are more interested in viewing and consuming the art as opposed to creating and displaying it themselves, there's the social level plan for $30 a month. For more information on becoming a member, visit the No Studios website. And for more information on events coming to the space, click here.